Acrylic on wood panel, 30 x 24 inches. Barbara Takenaga, Blue on the Horizon, 2013. Acrylic on linen, 54 x 45 inches. Barbara Takenaga, Blue Geode (J.S. ), 2013. Acrylic on wood panel, 20 x 24 inches. Barbara Takenaga, Blue Splash, 2013. Acrylic on linen, 42 x 36 inches. Barbara Takenaga, Two Waves, 2013. Acrylic on linen, 36 x 72 in. Barbara Takenaga, Geo Constellation, 2013. Barbara Takenaga, Geode Diptych, 2013. Acrylic on linen, 36 x 42 inches (each); 36 x 84 inches (overall). Barbara Takenaga, #3 Black and Silver Grid, 2013. Barbara Takenaga, Geode Sky (tipped horizon), 2013. Barbara Takenaga, Green Light, 2013. Barbara Takenaga, Lines of Force (red), 2013. Acrylic on wood panel, 54 x 45 inches. Barbara Takenaga, Red/Pink Funnel (J.N. ), 2013. Acrylic on wood panel, 40 x 30 inches. Barbara Takenaga, Red Funnel, 2013. Acrylic on linen, 70 x 60 inches. Barbara Takenaga, Red Cloud (golden egg), 2013. Barbara Takenaga, Red Thing, 2013. Barbara Takenaga, White Grid on Silver, 2013. Acrylic on linen, 54 x 90 inches. Barbara Takenaga, Wine Dark with Star, 2013. 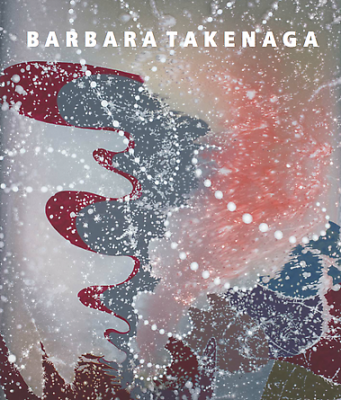 DC Moore Gallery is pleased to present an exhibition of Barbara Takenaga’s most recent paintings, which are her boldest and most diverse yet. Takenaga has recently introduced evocative horizon lines in her abstract explorations of pattern and movement, and this group suggests natural phenomena like never before. At the same time, Takenaga remains a committed abstractionist, pushing her radiating dots across these canvases in newly bright, saturated, and varied hues. Accompanying the exhibition is a fully illustrated catalogue with a conversation between Takenaga and Robert Kushner. Takenaga’s references to the natural world may appear more literal—titles include Geode Sky (tipped horizon), Two Waves, and Red Cloud (Golden Egg)—but their subjects are so expansive that they approach the ontological. While swirls of dots and lines form acidic tornadoes, scalding magma, and exploding supernovae, they tease the eye with indications of scale and motion, but there are also bigger questions at play. Do Takenaga’s hypnotic, chaotic explorations depict creation or destruction? Are they apocalyptically serious or cartoonish and playful? Takenaga achieves such myriad effects by balancing her twin impulses both to meticulously lead and to loosely follow the paint. Beginning with a thin layer of paint applied gesturally, she uses this base as a template over which to build her rich and vast scenes. Takenaga’s last solo exhibition at DC Moore Gallery featured optical meditations on icy, sea-foam grays. In the past, she has challenged herself to paint the same motif—a swirling, dotted mandala—dozens of times in the same small format. By contrast, this exhibition features a variety of iconographies on a much larger scale. Artcritical’s David Cohen has called Barbara Takenaga “a high priestess in the cult of nutty, trippy, transcendentally labor intensive abstraction.” Her work has been exhibited at the Pennsylvania Academy of the Fine Arts, Philadelphia; Mass MoCA, North Adams, MA; Museum of Contemporary Art, Denver, CO; and the National Academy Museum, New York. Her work was highlighted in the MIT Press publication Psychedelic: Optical and Visionary Art Since the 1960s (2010). Takenaga is the Mary A. and William Wirt Warren Professor of Art at Williams College. She divides her time between Williamstown, MA and New York City.